Megadeth frontman Dave Mustaine and his wife, Pam, held a press conference on Friday to ask for the publics assiatance in locating his mother-in-law, Sally Estabrook, who has been missing since October 4. 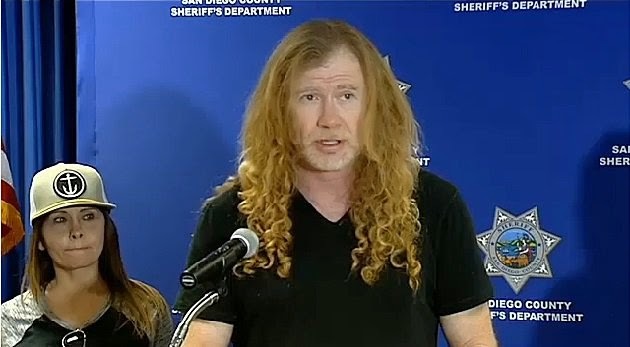 NBC News 7 San Diego reports Mustaine spoke about the disappearance and search for the 75-year-old, who was last seen around 4 p.m. on October 4 at the Pinezanita RV Park and Campgrounds on Highway 79 in Julian, about 60 miles east of downtown San Diego. “Also, anybody that's working in the medical field, in the hospitals and shelters, any of the senior citizens, adult homes, stuff like that, look at your patients,” added Mustaine. “Maybe there's somebody there that's not supposed to be there. We need your help. 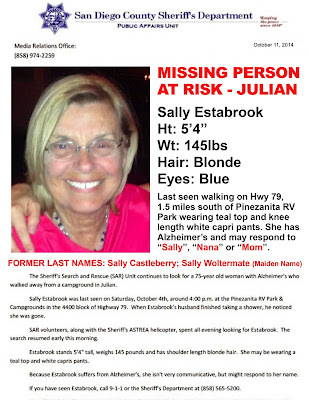 For any of you that are watching this right now, we're just asking that if you see Sally — we call her nana — she's probably not gonna answer to you, just call 911 and then we'll go from there." Mustaine said the search for Estabrook has intensified over the past few days, with search and rescue crews now looking in areas outside the Julian campground for any traces of the missing woman.